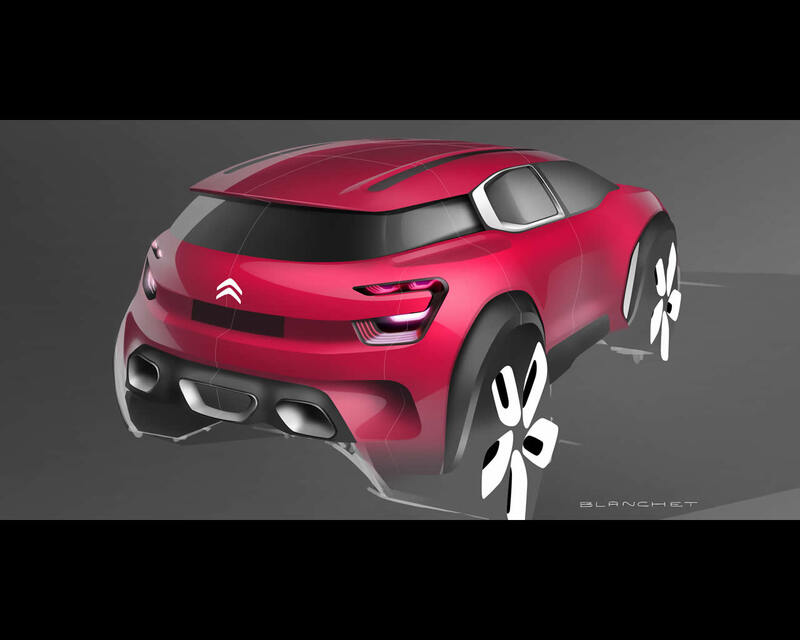 As the brand celebrates 50 million vehicle sales since its creation some 95 years ago, Citroën is unveiling a surprising, creative and bold new concept car ahead of the Shanghai Motor Show. UNIQUE PERSONALITY: Citroën Aircross boasts a unique presence among SUVs. 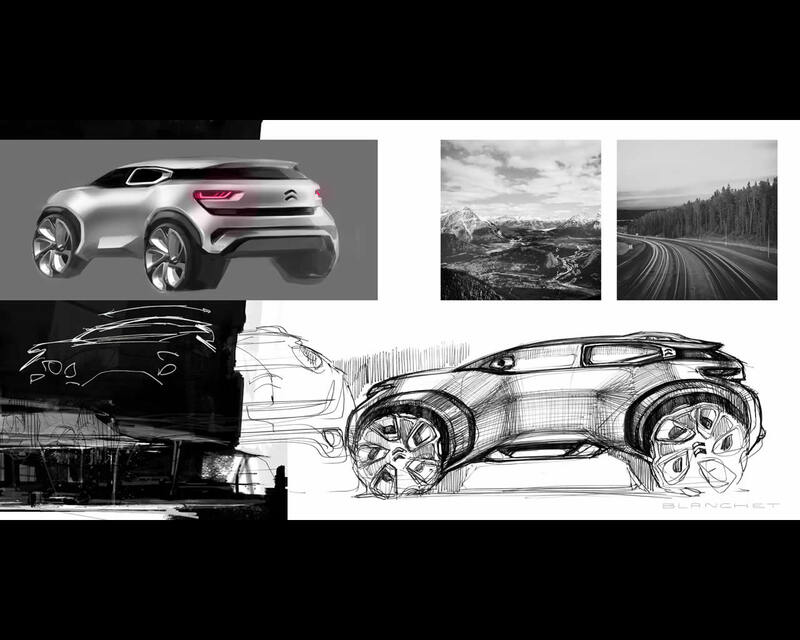 Its balanced and flowing design gives this protective and welcoming concept car a strong identity and a resolutely optimistic spirit. FOCUSES ON COMFORT & A SENSE OF WELL-BEING: The cabin brings a new approach to travel with a modern, bright, fresh and functional design for the occupants’ physical and mental well-being. TECHNOLOGICAL INTELLIGENCE FOR RELAXED MOBILITY: Dialogue and sharing are key themes in this connected SUV. Citroën Aircross features innovative graphic interfaces and plug-in hybrid technology. INTERNATIONAL: The Citroën Aircross illustrates the brand’s international ambitions, building on the success of the New C4 Cactus, with a body style intended for worldwide sale. DIFFERENT: The Citroën Aircross concept offers new design codes whilst respecting the essential characteristics of an SUV. Drawing on the product and styling traits of C4 Cactus, the body design and cabin ambience express a sense of modernity and a unique ‘feel good’ spirit. 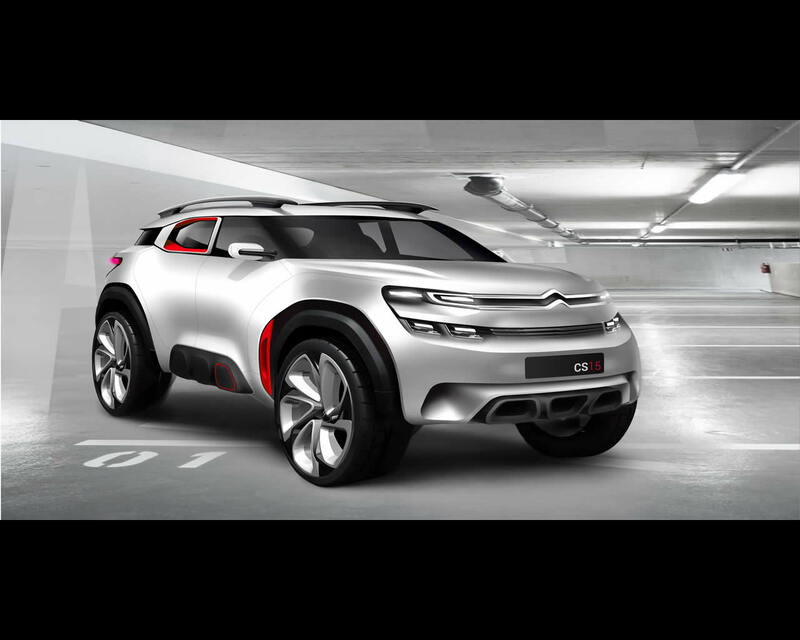 This new concept car illustrates Citroën’s ability to assert its identity in all vehicle segments. A pure and engaging personality, through the overall balance of the body styling underscored with flowing forms that are punctuated by strong graphic components, including ‘Alloy Bumps’ and ‘Air Signs’. The positive design is heightened by vibrant orange-red paintwork symbolising energy and serenity, with innovative materials denoting robustness. A styling approach emphasising functionality and aerodynamics. AN INVITATION TO TRAVEL: The cabin offers an immediate sense of comfort. Everything inside the Citroën Aircross is designed to promote occupant well-being. In addition to the physical comfort provided by the broad and generous seats, well-being is enhanced still further with the use of new materials and a blend of light, invigorating colours. The pure, horizontal lines of the exterior suggest a feeling of interior space, while the ample geometric shapes of the uncluttered interior offer a combination of appealing aesthetics and functionality. The Citroën Aircross concept represents a new approach to travel with specially designed storage compartments and the use of luggage style ‘straps’ in a fresh and contemporary cabin that invites passengers to take to the road together. TECHNOLOGICAL INTELLIGENCE: With a focus on practicality, occupants are able to choose between a shared and an individual travelling experience. The concept car is equipped with two 12-inch HD screens, one of which moves across the dashboard so it can be seen by more than just one passenger. Each seat is equipped with speakers and microphones to encourage dialogue between the occupants. Technological intelligence is also expressed in the choice of the plug-in hybrid drivetrain to combine efficiency and top-level performance. The Citroën Aircross features meaningful technologies for relaxed mobility and a new travelling experience. 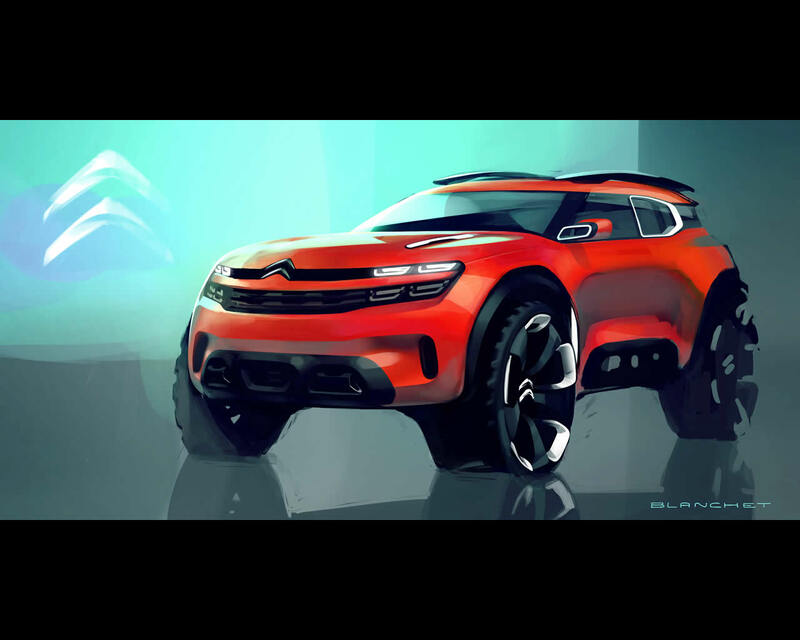 The Citroën Aircross concept conveys a sense of power and determination. The body is set on large wheels with 275/42 R 22 tyres. The tyres were designed exclusively for Citroën Aircross by Continental and feature large tread blocks and a unique pattern for excellent traction on the most demanding surfaces. The striking design of the wheels highlights the all-terrain abilities of the Citroën Aircross. With its parallel-to-the-road waistline, the new Citroën Aircross conveys an air of confidence, but without the feeling of arrogance or aggression. 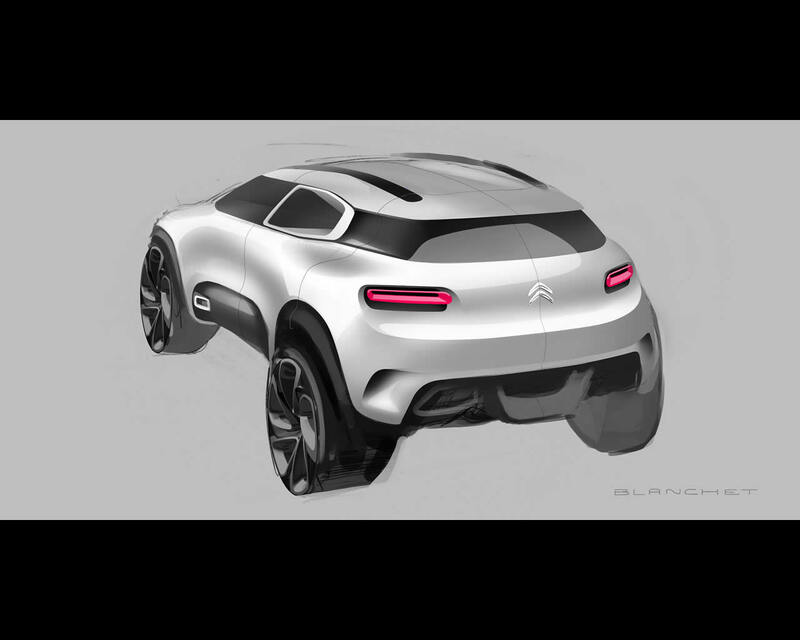 The front and rear bumpers fully convey Citroën’s design identity. The front end features a new chevron design and a two-tier light signature, which first appeared on the latest-generation C4 Picasso. At the rear, the new 3D-effect lights have a high-tech and emphatically graphic appearance. These classic Citroën design touches are rounded out by a floating roof and uninterrupted area of glass right around the cabin. The body of the Citroën Aircross is punctuated by strong graphic components designed to enhance functionality. 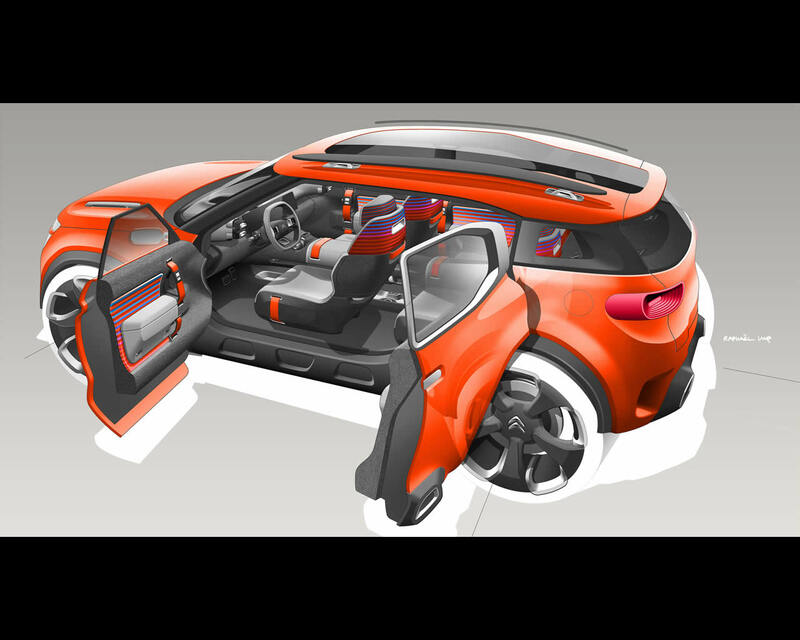 Citroën has developed a fresh take on the Airbump® technology of C4 Cactus, adapting it to SUV requirements. Whilst Airbump® technology is designed to protect the car’s body from everyday bumps and scrapes, the ‘Alloy Bumps’on the Citroën Aircross are there to protect the vehicle from lateral impact with their visible padding. The ‘Alloy Bumps’ are made using a highly absorbent aluminium honeycomb structure, which was first used in motorsport, and combines protection, lightness and style. The ‘Alloy Bumps’ are an innovative and fitting solution for the SUV segment. The graphic components also highlight the search for enhanced aerodynamics, on bodywork that has already been optimised for efficient air penetration. The ‘Air Signs’ are chrome-finished signatures that surround each rear window to form an air-flow tunnel. In addition, ‘Air Curtains’ are air intakes located at the front of the concept car. These two features are accompanied by front and rear wheel arch extractors and the highly tapered shapes of the door mirrors. Together these components improve the overall aerodynamics of the Citroën Aircross while enhancing its design. The ‘Air Signs’ play a two-fold role, improving aerodynamics while highlighting the importance of the second row of seats. With the Citroën Aircross, particular importance has been placed on the passengers and the interior. This is an SUV for sharing. 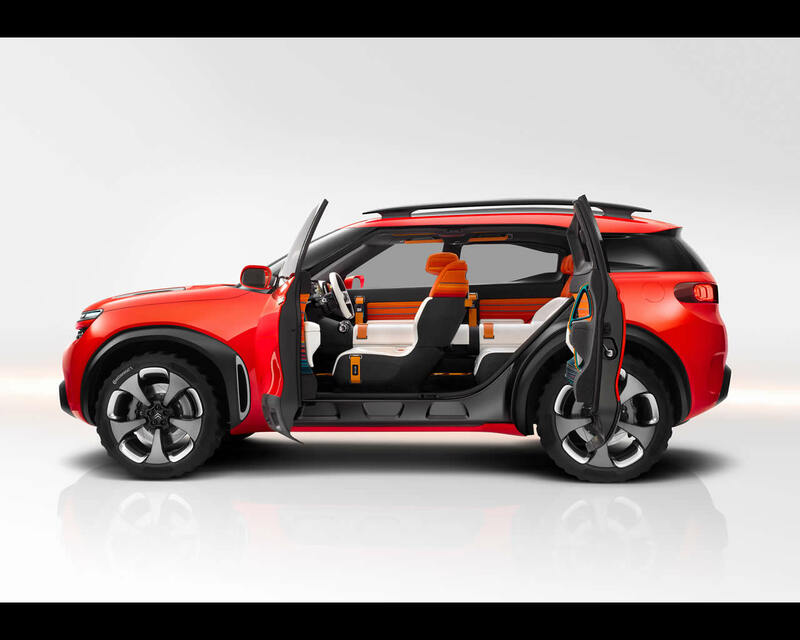 The Citroën Aircross concept features intense orange-red body paint, signifying optimism and open-mindedness. The colour elicits anything but indifference and underscores the lines and shapes of the vehicle. To ensure continuity between the exterior and the interior, the colour perfectly matches the cabin colour scheme. The orange-red hue is punctuated by solid metal elements on the base of the wing mirrors, grille, ‘Air Signs’ and towing hooks. These raw and authentic components lend an air of assurance and robustness to Citroën Aircross, confirming its SUV nature. The Citroën Aircross interior immediately denotes a sense of total comfort, transforming road travel into a time of well-being for the body and the mind. In this respect, the Citroën Aircross takes an all-new path, avoiding classic automotive cues to create a modern cabin where the occupants simply feel good. Generous, open spaces creating a feeling of balance and serenity,while remaining highly functional with ingenious storage compartments. Flowing forms contrast with technical components, as seen in the smooth and floating dashboard, punctuated at regular intervals by air vents and the two large screens – the only visible interface in the uncluttered interior. A graphical approach that emphasises the feeling of space and comfort. 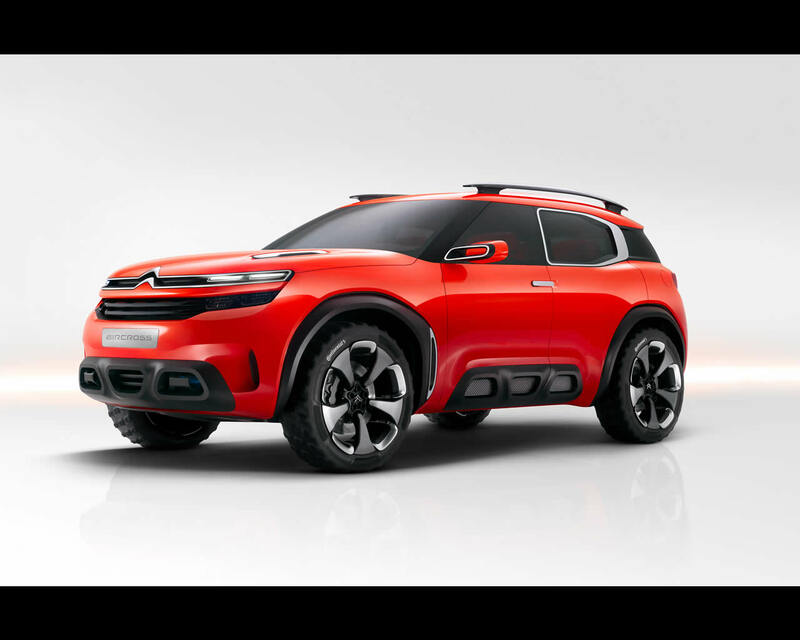 The Citroën Aircross showcases the ‘sofa’ spirit initiated by the C4 Cactus, reinterpreted with SUV styling. A horizontal design effect is created with graphic continuity between the doors, seats and central console, and by the thick white leather upholstery on the seats and the central console. This horizontal take on cabin design further contributes to the feeling of complete comfort. Well-being is also generated visually, by the bright and colourful interior that is in total harmony with the exterior body colour. The atmosphere is refreshing and modern, with white leather contrasting with orange stitching. This approach to colours and materials enhances the all-enveloping atmosphere inside Citroën Aircross. Physical well-being is encouraged by the ‘king-size’ seats. The seat backs are open and welcoming, inviting passengers to embark on a new kind of travel experience. The generous, wraparound headrests contribute to the overall feeling of comfort. The upper parts of the seats are finished in a mesh-like material that lends a warm and inviting feel to the cabin. This reinterpretation is both highly technical and futuristic, although it also hints at vintage materials that evoke pleasant travel memories for all passengers and constitutes a source of inspiration for Citroën’s designers. 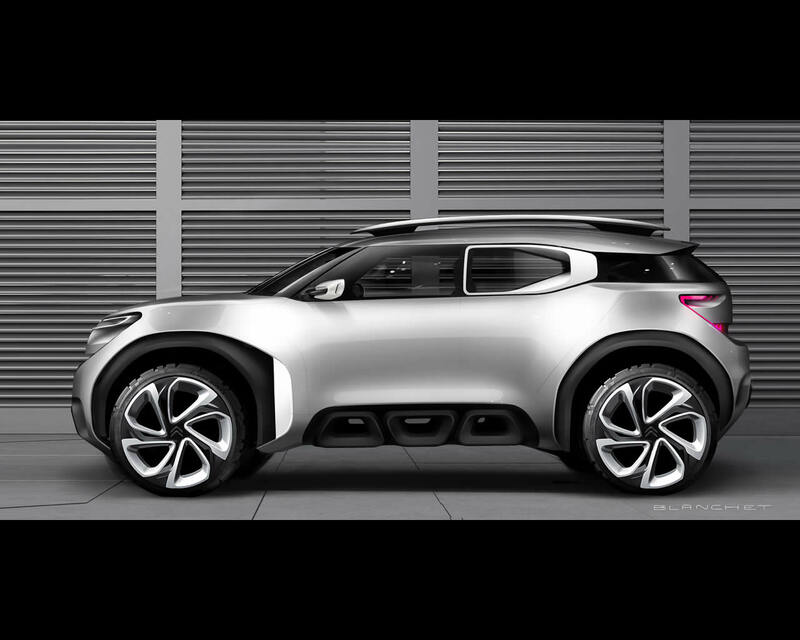 Picking up where C4 Cactus left off, the Citroën Aircross concept also references the world of travel and luggage. The luggage-maker spirit is expressed in the design of the eminently practical storage compartments, including a reinterpretation of the central console. This classic SUV feature takes on a new dimension inside the Citroën Aircross, as it frees up space for generous and functional compartments. Ingenious storage spaces are also found in the door panels and the upper part of the dashboard. The travel theme is also expressed in the use of straps for the grab handles. Featuring on the doors and on the console, they fit in perfectly with the SUV spirit and serve both a practical and design function. Inside the Citroën Aircross, aestheticism complements practicality. 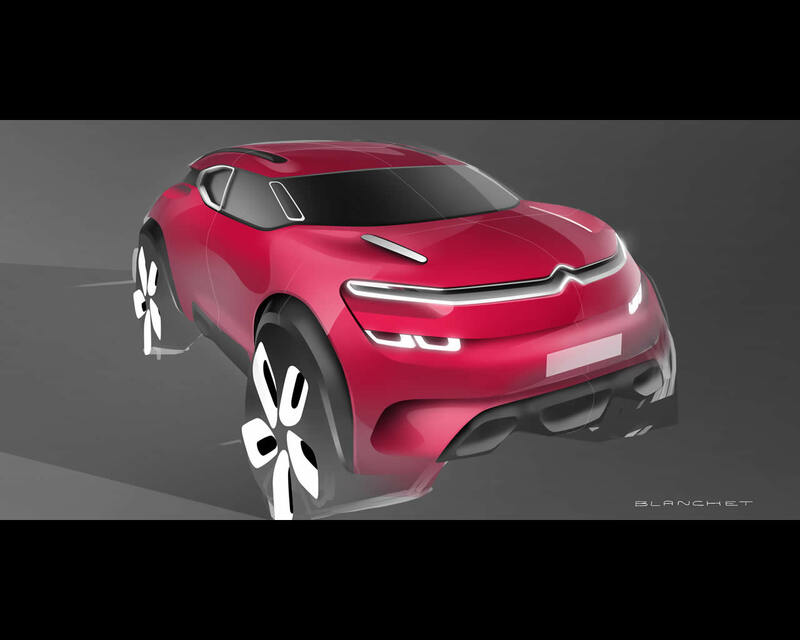 Innovative screens: A strong graphic personality is a hallmark of Citroën. In addition to a head-up display, Citroën Aircross is home to two 12-inch panoramic HD screens with all-new graphics inspired by the worlds of fashion and modern furniture design. The screens artfully display driving information and infotainment content with unrivalled graphic richness. In keeping with the cabin ambience, sparkling colours and pixels lend warmth to the digital atmosphere on board Citroën Aircross. The bold colours are worlds apart from conventional automotive cues. A mobile & motorised screen: One of the two screens can be transferred from passenger to passenger with a simple movement of the hand via a detector on the console. With this feature, passengers can access information on the move, watch films, select music and even choose a local exhibition to be visited. Ultra-connected, passengers become as proactive in the journey as the driver. The two screens can also be merged to form one. This is controlled by the driver using touch pads on either side of the steering wheel. Audio spatialisation for peerless acoustic comfort: Each of the four seats is equipped with speakers and a microphone to facilitate dialogue between the occupants or to allow an individual in-cabin experience. Using these ‘sound bubbles’, each passenger can choose who they want to speak to while respecting the relaxation of their fellow travellers, making the journey a time for calm or communication – the choice is theirs. Interaction with the outside world: Two webcams are located on either side of the cabin in the door frames. These cameras are able to take pictures outside the car, creating an album that can be shared on social networks. Displayed directly on the in-car screens, the images recorded by the webcams can also be used to gather information on sites of local interest and information on how to get there using the navigation system. Travelling on board Citroën Aircross is a fun experience that can be shared by all. Citroën Aircross is powered by plug-in hybrid petrol technology, with an electric motor located on the rear axle. This configuration is a perfect fit for the Citroën Aircross, optimising performance and traction while ensuring low fuel consumption and emissions. The electric motor develops 95bhp (70kW) and torque of 200Nm. The motor is powered by lithium-ion batteries that charge up in just three and a half hours via a 16A domestic socket. The electric motor is combined with a 1.6 THP petrol engine developing 218bhp (160kW) and torque of 275Nm. With its plug-in hybrid powertrain, the Citroën Aircross respects the environment. This is especially true in urban driving conditions in ZEV mode. This all-electric mode has a range of 31 miles (50km). On roads that require successive acceleration and deceleration, the hybrid technology limits fuel consumption by combining both energy sources. On the motorway, the internal-combustion engine takes over, providing optimum high-speed performance. No compromise has been made in terms of driving pleasure. When the driver accelerates quickly and torque is required immediately, a boost function combines the torque of the internal-combustion engine and the electric motor delivering optimum performance with up to 313bhp available. Combined cycle fuel consumption is 166mpg (1.7 l/100 km) and CO2 emissions are an impressively low 39g/km. Citroën Aircross accelerates from 0 to 62mph in just 4.5 seconds.